When I first tried uni, at a little sushi restaurant in Honolulu in the summer of 2008, I was not a fan. Something about the texture, the saltiness, and how exotic it seems just put me off. For the next three years, I was convinced that I just plain didn’t like uni. In spring of 2011, I was at a fellow food blogger’s house, filming some sustainable sushi videos for a friend with a couple of other friends of mine who are also food bloggers. 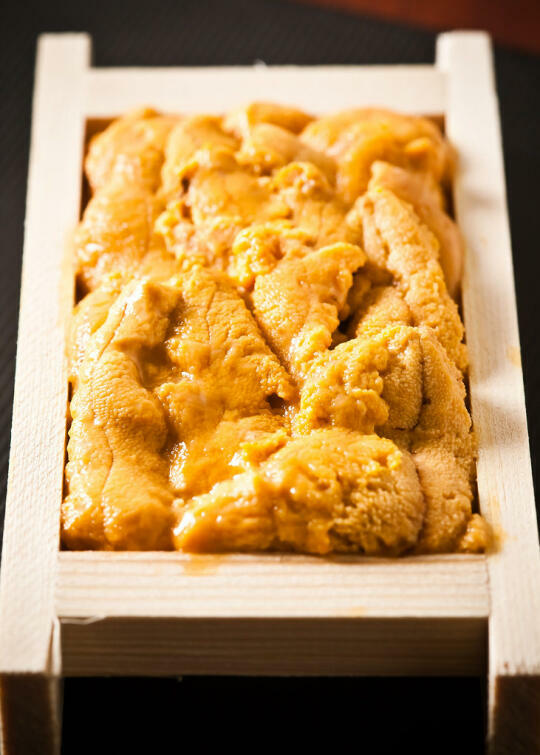 Among the types of seafood we had to work with was some fresh golden uni. Since this was my first time meeting Rachael and Greg, and at the time I had only met Cathy and Martin once… I sure as heck wasn’t about to admit that I, a sushi blogger, didn’t like uni. Especially since everyone else was raving about it so much. So I tried the uni temarizushi that Rachael made… and they were actually pretty good. Then I ventured to try the fresh uni straight from the tray… suffice to say that since then, I’ve become a full-on uni lover. If you want to know more about uni, why not listen to the uni episode of my Miso Hungry Podcast? A few weeks ago, Rachael gave me a cool little kitchen toy called a Rice Cube. (Disclaimer: I got this as a gift, and Rice Cube also donated several Rice Cubes for us to give away on our podcast.) 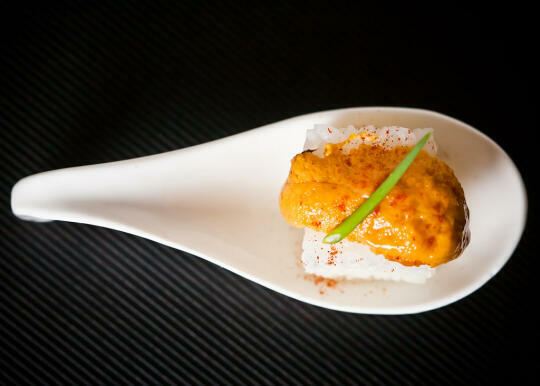 So when I bought a tray of uni for the uni episode, I wanted to find a way to use the rice cube with it. I tried compressing the uni into a cube with the rice… but that just looked ugly (though still delicious). So instead I made a cube with the sushi rice, laid a lobe of uni over it, then sprinkled it with paprika and topped it with a sliver of green onion. I actually liked this better than normal nigiri, because not only was it ridiculously easy to make, the ratio of rice to uni was also perfect. If you want a Rice Cube for yourself, you can buy one through their campaign to fight childhood obesity on IndieGoGo at a discount and have the proceeds go towards fighting childhood obesity. OR… you can head over to the Tako Episode of my podcast, where we’re giving away three of them! 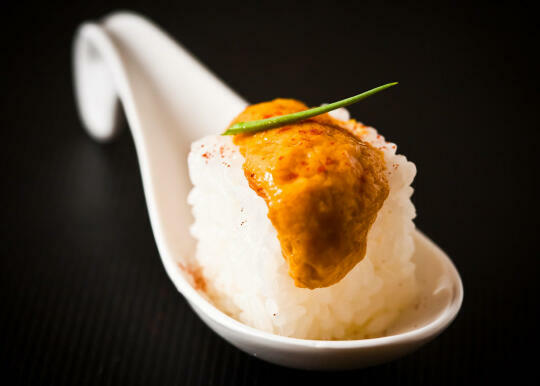 Top your cube or ball of rice with one lobe of uni (or two if they’re small). Sprinkle with a little paprika, and top with a sliver of green onion. I love your uni rice cube creation! BTW, did I tell you that after you told me about yours, I totally copied you? And you’re right, the uni to rice ratio IS perfect!! This looks like something I’ve never done or even seen before. So, I’m going to give it a try for me and my husband. What a fantastic foto ! It looks delicous ! please publish more of this ! Felicidades chicos, nunca habia un blog de sushi tan bueno y completo como el de ustedes, tiene muchas recetas y exelentes ideas, felicidades!! This is a very unique spin on using uni. It looks a little bit liquefied eh? By any chance do you have a recipe for sushi rice. May try to make my own sushi here in Vancouver. Been mainly eating at the local sushi restaurants but considering trying to purchase fresh uni (they sell it live even here from the fisherman wharf at Steveston) and then maybe giving it a try with some sushi rice. I wouldn’t try the Sake or salmon sushi though; afraid about whether it’d be sushi grade fish. They have it fresh still from the fisherman wharf but you really got to know how those sushi are stored to know you can eat it raw.